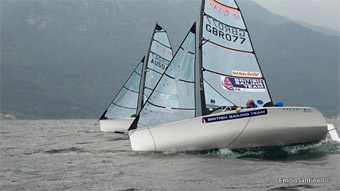 Light winds across the week were on hand for the Garda Trentino Olympic Week regatta. 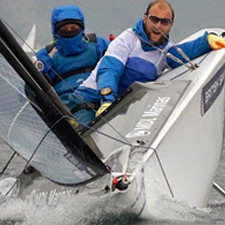 10 SKUD18 teams from around the world came to Italy for a final hit out before the Para World Sailing Cup in Medemblik at the end of the month. 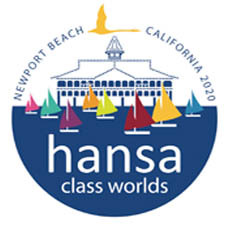 After a long wait for wind on day 1, two races were completed in light conditions with the Australian team of Fitzgibbon & Tesch on top after racing. Day 2 saw racing abandoned due to no wind. Day 3 saw the wind, and rain, return for the start of competition. Brits Rickham-Birrell took the lead after a fifth on day 1 was followed by a string of firsts. 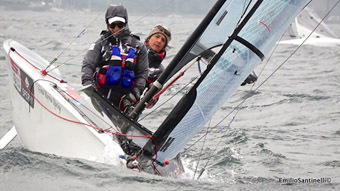 In second place are Australians Fitzgibbon-Tesch who were penalised by a non start in race 5 preceded by a 3-2. Canadians McRoberts and Gay are in third, with Italians Gualandris-Zanetti moving up into fourth place. On the fourth day, winds were from the north this morning but with less intensity compared to Wednesday. After two further races, the first two positions are unchanged with only one point dividing Rickham-Birrell of Great Britain and Australians Fitzgibbon-Tesch, who picked up two firsts to be 10 points clear of Canadians McRoberts-Gay in third. The final day saw the poor winds continue, and no racing was possible for the SKUD18 fleet, so the final results remained Rickham-Birrell 1st, Fitzgibbon-Tesch 2nd and McRoberts-Gay in third. 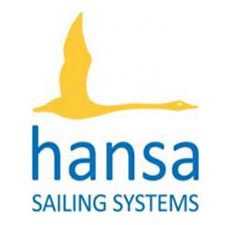 Teams will now make their way to Medemblik for the Delta Lloyd Para World Sailing Championships and World Hansa Class Championships. Full results are available via this link.